The microorganisms in your gut may directly affect the feelings in your brain. It’s a theory researchers have been investigating recently. A new study specifically found that people who eat fermented foods like yogurt, kefir, fermented soy milk, miso soup, sauerkraut, some dark chocolates, microalgae juices, pickles, tempeh and kimchi are less likely to suffer from social anxiety disorder. Two psychology professors from the College of William & Mary, Matthew Hilimire and Catherine Forestell, teamed with Jordan DeVylder, a social work assistant professor at the University of Maryland, to see if they could find a connection between consuming fermented foods and lower social anxiety. They surveyed about 700 students in three William & Mary Intro to Psychology classes to better understand their personality types and eating habits (as well as other factors). Previous research conducted on animals led the three professors to hypothesize that they might see a connection between fermented foods and mental health, and sure enough, their study proved them right. 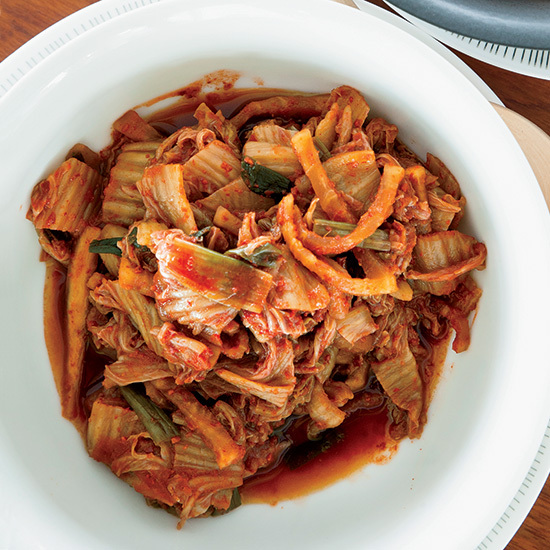 “It is likely that the probiotics in the fermented foods are favorably changing the environment in the gut, and changes in the gut in turn influence social anxiety,” Hilimire was quoted as saying. “I think that it is absolutely fascinating that the microorganisms in your gut can influence your mind.” Findings in animal studies have shown that giving animals probiotics can increase GABA, a neurotransmitter connected to lower anxiety. The William & Mary study showed that the connection between fermented foods and lower anxiety was especially strong among students who have neuroticism. “The main finding was that individuals who had consumed more fermented foods had reduced social anxiety, but that was qualified by an interaction by neuroticism. What that means is that that relationship was strongest amongst people that were high in neuroticism,” Hilimire said. Despite the results, the research team believes more testing is needed to prove a direct causation (as opposed to just a correlation) between eating more fermented foods and having lower social anxiety. But there’s probably nothing wrong with eating a bit more yogurt. At the very least, it’ll probably put you in a good mood just because its tastes delicious.